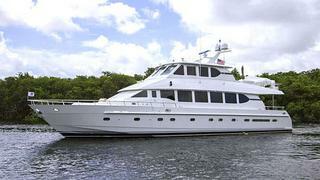 Rich Lazzara at Lazzara Lenton tells me he's found a buyer for the 25.6m motor yacht Pomboo, listed for sale by Michael DiCondia at Hargrave Yacht Sales. Pomboo was built by Taiwan's Monte Fino yard and delivered in 2004 with a thorough exterior and interior refit in February 2012. She is designed to sleep up to seven guests in three large staterooms comprising a master suite, VIP stateroom and a twin. Each guest stateroom is well appointed and has en suite bathroom facilities. When the need arises, there is an additional berth on the sky lounge convertible sofa. The saloon is a warm, comfortable room which easily adapts to formal or relaxed family events. It is furnished with a generous custom three piece sectional sofa, cocktail table and a lounge chair with ottoman. A raised marble bar with fridge and ice maker make the area a uniquely open space for entertaining, flowing from the saloon to the dining area to the 'country kitchen' galley. Twin 1,550hp Caterpillar engines give her a cruising speed of 18 knots and a maximum speed of 21 knots. Pomboo was asking $2,350,000 and will be renamed Positive Energy.